The Infinity Lock Box was originally released approximately two years ago. During this time, it has proven itself as a player favorite among all of our Lock Boxes. In celebration of this popularity, we’ve decided to give the Infinity Lock Box an entire full-size run! This special Lock Box, containing prizes from nearly all previously-retired Lock Boxes, will be available again for a multi-week appearance beginning with the release of the Season 14.5 Update on April 3rd, 2018. During this time, enemies defeated on both Ground and Space maps will have a small chance of dropping one of these prize-filled packages, while the Discovery Lock Box will be retired. We’re making some changes to the Infinity Lock Box prize tables in preparation for this full-length appearance. Our hope is that these changes will streamline the box’s contents a bit, and allow players to more easily claim the prizes they want when opening the many Choice Packs contained within the Infinity Lock Box. “Tier 6 Ship” and “Ultra Rare T6 Ship” boxes will be combined into a single pack. Feedback on the existing Infinity Lock Box has indicated that the inclusion of a reward within the Lobi Crystal prize options hasn’t been well-received. And since we’re unlikely to be adding more ships to the Ultra Rare pack in the future, combining these packages seems like the best option for both the player and developer experiences going forward. Existing versions of both boxes now contain all of the combined options of both of these packages, and both display the name “Infinity Prize Pack: Tier 6 Ship” as of this update. “Tier 5 Ship” and “Secondary Ship” boxes will be combined into a single pack. Our continued efforts to convert older Tier 5 Lock Box ships to Tier 6 has led to the offerings available in the Tier 5 Ship box to dwindle more and more as time goes by. Combining it with the long list of ships currently included in the Secondary Ship pack is an effort to avoid a situation where this pack loses all value due to having little or nothing to offer. Existing versions of both boxes now contain all of the combined options of both of these packages, and both display the name “Infinity Prize Pack: Tier 5 Ship” as of this update. All T6 Faction-specific ships are now contained within a tradeable secondary pack, which opens into the correct ship based on the person opening it. 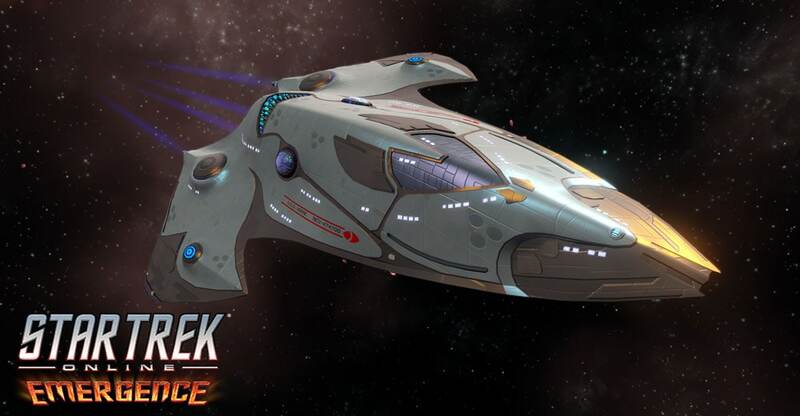 In essence, players of any faction that open an “Infinity Prize Pack: Tier 6 Ship” will be presented an option to choose ship packs named “Kelvin Timeline Starship” or “TOS Dreadnought Starship” (among the many other existing choices). Each of these new boxes may be traded to other players, and will reward a ship appropriate to their faction upon opening, rather than locking in the ship at the time that the Infinity Prize Pack is opened. This change applies to the Kelvin Timeline and TOS Dreadnoughts, so that their reward structure now matches the Temporal Science Vessels. Includes a chance of winning a Tzenkethi Vanity Shield! In addition to these added items, we’re very excited to announce the inclusion of new Tier-6 versions of a few of our previous Tier-5 Lock Box starships! Each of these new vessels will be replacing their Tier-5 counterparts in the contents of the Infinity Lock Box, and on the Lobi Store. Keep reading for stats and details on each of these newly-upgrade starships! Special Note: As of the release of this updated to the Infinity Lock Box, the special Consoles associated with these starships are no longer ship-restricted, but may instead be used on any starship you own. This includes both the newly “Enhanced” versions of these consoles obtained from the new T6 ships, as well as existing versions obtained from the T5 versions of these ships. Click to the right on the below images to see all three ships! These starships feature a Lieutenant Commander Science/Temporal Operative Specialist Bridge Officer seat. The Tipler Cylinder console module can actually rewind time! The dense beryllium cylinder core of this module rotates at near-light speed allowing your ship to perform a Temporal Backstep and rewind time approximately 13 seconds. Your ships position reverses, and some of your ship's hull and shield damage is restored. Additionally, the cooldown and recharge times on all your abilities are rewound. This console also provides a passive boost to Exotic Damage, and Starship Shield Capacity Skill. This console mod can be equipped on any starship. Only one of these consoles may be equipped on a ship at a time. The Tipler Cylinder is part of a set. If you also have a Manheim Device console equipped, activating the Temporal Backstep will cause all nearby foes to freeze in time until the sequence has ended. While this trait is slotted, traveling above 88 Impulse Speed will cause you to gain stacks of "Out of Time" while suffering minor cold damage each second. When you then drop below 88 Impulse Speed, all stacks of "Out of Time" are removed and a scaling bonus to your Bridge Officer Recharge times is applied based on the number of stacks obtained (25 max stacks). Click to the right of the images below to see all three ships! These starships feature a Lieutenant Commander Tactical/Temporal Operative Specialist Bridge Officer seat. This console is based on Dr. Paul Manheim's time-gravity work in the early and mid-24th century. Dr. Manheim's experiments caused ripples in time now known as the Manheim Effect. The Manheim Device console can create quantum duplicates of yourself - one from your past, and one from your future. This console also provides a passive boost to Shield Hardness, Drain Expertise, and Control Expertise. This console mod can only be equipped on any starship. Only one of these consoles may be equipped on a ship at a time. The Manheim Device is part of a set. If you have the Manheim Device and the Tipler Cylinder consoles equipped, activating Temporal Backstep will cause all nearby foes to freeze in time until the sequence has ended. While this trait is slotted, suffering Electrical or Radiation damage will grant a reduction to the cooldown timers of your Captain abilities. This may only trigger once every several seconds. All of these starships come with access to a special Bridge / Ship Interior. For players that own the existing T5 versions of these ships, or other ships that included visual unlocks for them, those same options will be added to those available on these T6 starships, allowing for additional customization!